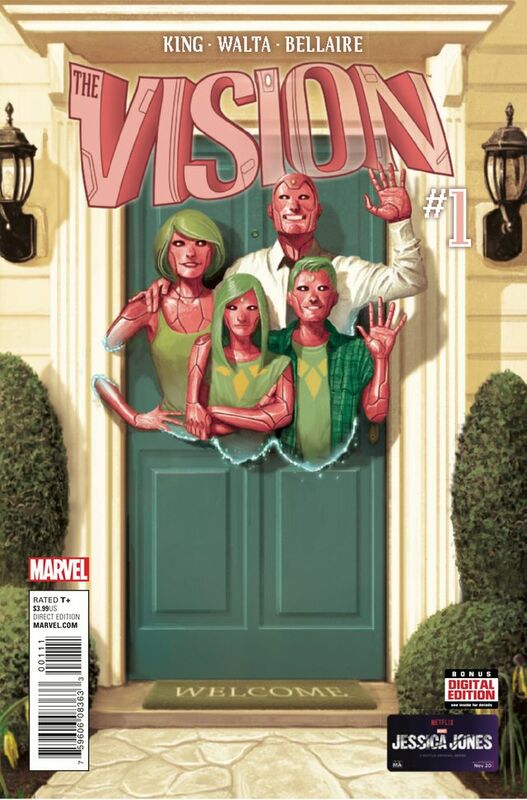 The Vision has a family. A wife, Virginia, and two children, twins named Viv and Vin, a pair of immature AI's created when he and his wife mixed their brainwave patterns. How he got them isn't entirely clear, though the issue hints that the Avengers and others aren't entirely happy with his methods. 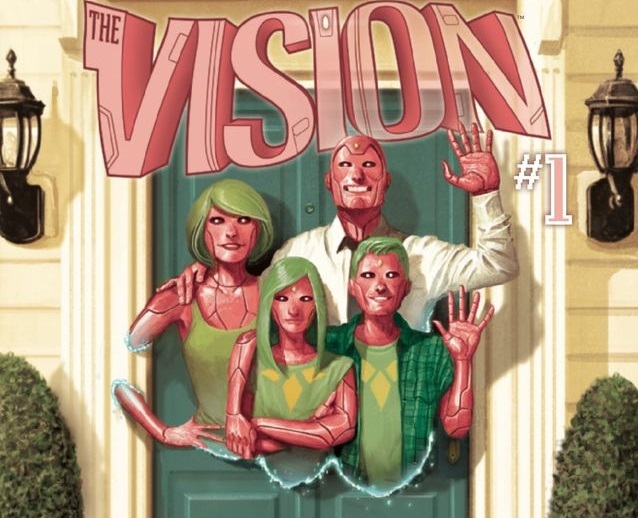 With his new family, the Vision has moved to the suburbs of Arlington, Virginia to begin a new job as the Avengers liaison to the White House. His two children will go to the local high school. They will meet the neighbors and gossip. And, occasionally, something really awful might happen to the town. Jordie Bellaire, one of the most prolific and talented colorists working today, is enormously important to the success of the book. Transposing the Vision - a bright pink robot with a lime green costume - and a whole family of similarly-colored synthezoids from the slightly surreal landscapes of action-adventure storytelling to more mundane high schools, suburban households, and offices feels immediately jarring. She mutes the coloring a bit, which helps it fit in with the autumnal feeling of the rest of the issue, and picks great colors to use as contrast - no teal and orange here. But she also works well with artist Gabriel Hernandez Walta, who gives the Vision family a rigid posture and, with the Vision and Virginia in particular, a style that wouldn't feel out of place in Mad Men or Lady Killer. The suburban classicism of their style actually highlights how out-of-place they are, moreso even than their pink color. Walta makes them so casually, physically inhuman that Bellaire's muted coloring actually eventually helps them blend into the background. Bellaire is always great, but Walta is someone whose work I wasn't familiar with before this issue; rest assured, I'll be keeping an eye out for his work in the future. One of the most fascinating decisions King makes is the nearly wall-to-wall narration of the book. 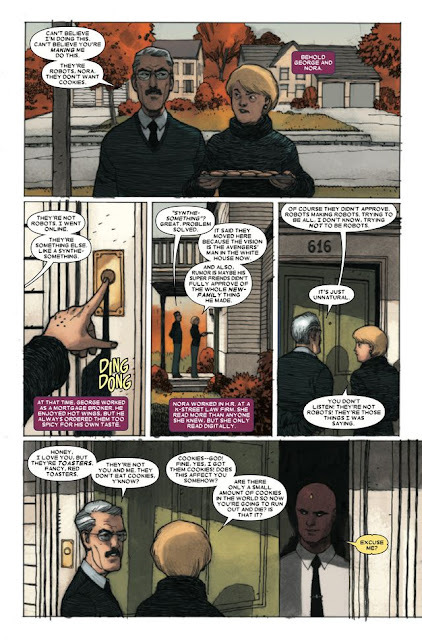 I've criticized a number of Marvel and DC books for this recently, especially Constantine: The Hellblazer and Doctor Strange, but The Vision #1 actually gets it right, at least in this issue. The narration is third-person omniscient, a distant voice that's incredibly rare in mainstream comics, and King gives it a methodical tone that at first just seems like a cutesy nod to the robotic intelligence of the Vision and his family. The distancing effect, both of the language used and of the third-person omniscient voice, directly contradicts much of the seemingly-sunny imagery on the page, and uses that dissonance to create an incredibly unsettling tone. Remove the narration, and you fundamentally change the tone of the story, which is not the case with books like the two I mentioned above. A midbook scene, for instance, finds two characters idly wondering about the inhumanity of their neighbors. Without the narration, the scene is common: Oh no, superhero moved in next door! Staid older homeowners unwilling to accept the new kids on the block is a familiar trope to build a story around, and The Vision sets that up. But while they walk and talk, the narration dispassionately tells us a story about the two neighbors future. It is a dark story, but it's also a story that raises interesting questions. Are they right to be concerned about their neighbors inhumanity? What prompts this future event, precisely? And, because we're empathetic creatures - is there anything we can do? There isn't, but there's a moment of hope, followed by a funereal pall that hangs over the remainder of the scene. Marvel has been chasing the success of Daredevil and Hawkeye for some time now. Those two books helped kick off a period of enormously strong critical respect for some of the solo books while allowing Marvel's creative staff to experiment, to build the foundation that future blockbuster stories could use for a smaller audience.The Vision #1 appears to be a phenomenal success along those lines, an unexpected and, yes, unsettling debut that mines a classic character for fascinatingly personal new depths. It is also, in some ways, at least, a deeply weird first issue. I can't say how well The Vision will sell. I can say that this is one of the sharpest, most ambitious books Marvel has put out in a long time, from one of the most exciting new talents to emerge at Marvel and DC. King is paired with an excellent art team here in Walta and Bellaire, and the three of them have turned in the must-read new Marvel comic.